As an award-winning, not-for-profit hospital, Arroyo Grande Community Hospital is committed to providing exceptional health care that will meet community needs now and in the future. Our mission is to deliver compassionate, high-quality, affordable health services; serve and advocate for the poor and disenfranchised; and partner with others in the community to improve the quality of life. Currently, at least 1,460 people are diagnosed with cancer each year in San Luis Obispo County alone. With our community’s support of the Legacy Campaign; a fundraising effort to update critical areas of the hospital, expand patient care capacity, and implement new medical technology; we are expanding our cancer program at Arroyo Grande Community Hospital. Mission Hope Arroyo Grande will provide cancer care services in a space completely dedicated to treatment, recovery and education. The space will include ten infusion chairs, a private room, and a resource center including a cancer rehabilitation program and appearance and image center. Care and education will be provided by a team of oncologists, a nurse navigator, dietitian, social worker, and pharmacist. One of the major barriers for a cancer patient is finding transportation to their many treatments. It is common to have several doctors’ appointments each week, and there are a number of issues that can make it difficult to get to treatments. A patient may be physically unable to drive, not have the means of transportation, or may not be physically well enough to use public transportation. Third-party transportation services are a costly expense that many cannot afford to use on a regular basis. 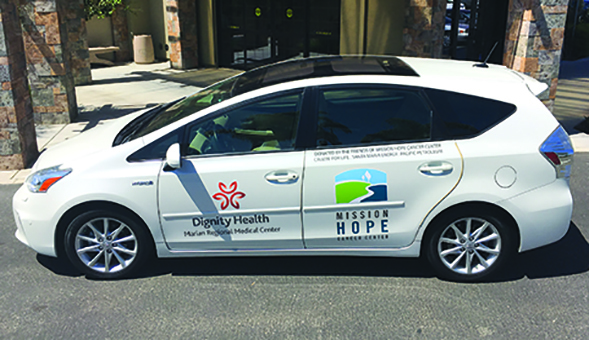 The Transport to Treatment Program will provide complimentary transportation for local cancer patients to and from their many appointments at Mission Hope Arroyo Grande and Mission Hope in Santa Maria as needed. To support the Transport to Treatment Program, please click here or contact us.